X = redistribute(mc,numSteps) returns data X on the evolution of a uniform distribution of states in the discrete-time Markov chain mc after it advances numSteps time steps. X = redistribute(mc,numSteps,'X0',x0) optionally specifies the initial state distribution x0. 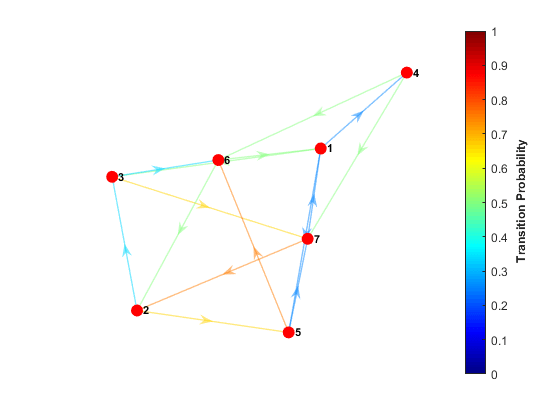 Create a four-state Markov chain from a randomly generated transition matrix containing eight infeasible transitions. Plot a digraph of the Markov chain. State 4 is an absorbing state. Compute the state redistributions at each step for 10 discrete time steps. 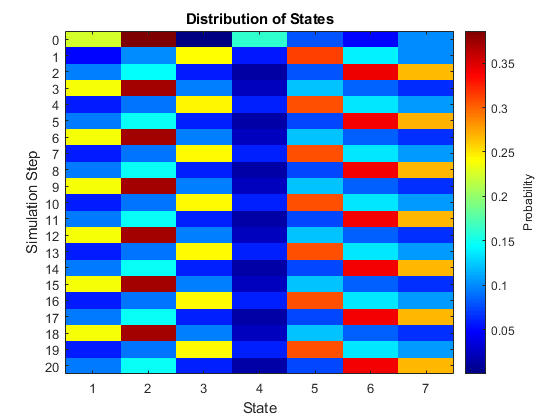 Assume an initial uniform distribution over the states. X is an 11-by-4 matrix. 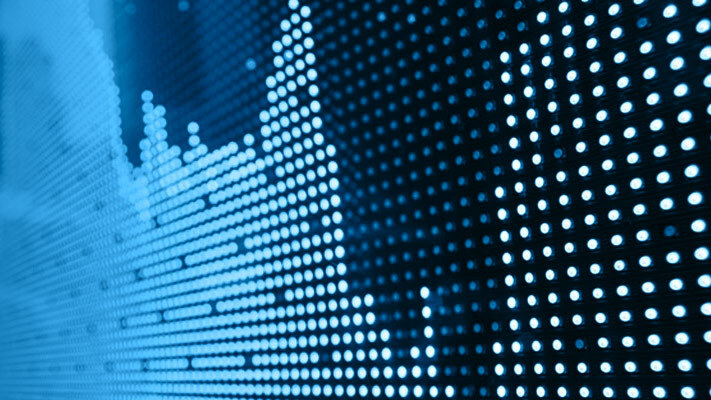 Rows correspond to time steps, and columns correspond to states. After 10 transitions, the distribution appears to settle with a majority of the probability mass in state 4. Compute a 20-step redistribution of the Markov chain using random initial values. The redistribution suggests that the chain is periodic with a period of three. Remove periodicity by creating a lazy version of the Markov chain. 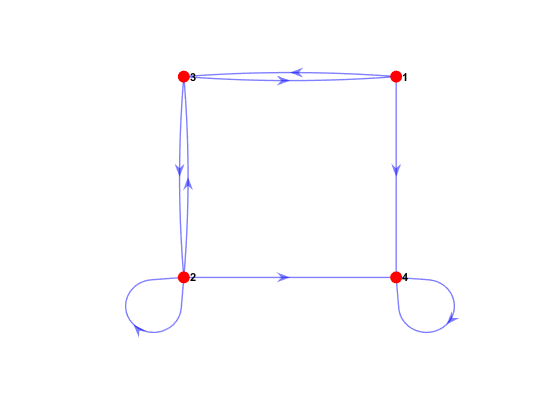 Compute a 20-step redistribution of the lazy chain using random initial values. Plot the redistribution. The redistribution appears to settle after several steps. Discrete-time Markov chain with NumStates states and transition matrix P, specified as a dtmc object. Number of discrete time steps to compute, specified as a positive integer. Example: 'X0',[0.5 0.25 0.25] specifies an initial state distribution of [0.5 0.25 0.25]. Initial distribution, specified as the comma-separated pair consisting of 'X0' and a nonnegative numeric vector of NumStates length. redistribute normalizes X0 so that it sums to 1. 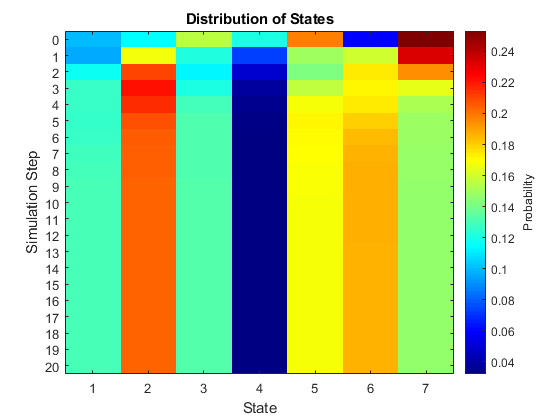 The default is a uniform distribution of states. 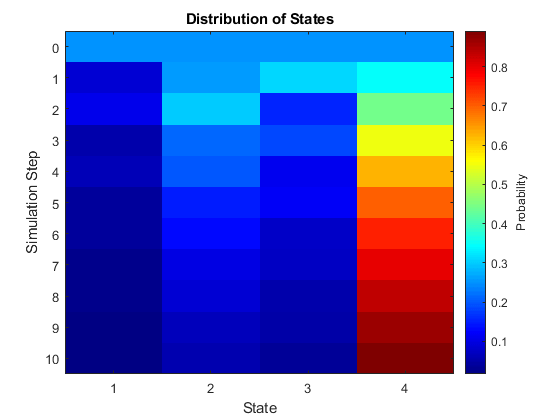 Evolution of state probabilities, returned as a (1 + numSteps)-by-NumStates nonnegative numeric matrix. The first row is X0. Subsequent rows are the redistributions at each step, which redistribute determines by the transition matrix P.
If mc is ergodic, and numSteps is sufficiently large, X(end,:) approximates x = asymptotics(mc). See asymptotics. To visualize the data created by redistribute, use distplot.